The Epiphone Les Paul Standard Royale delivers the signature sound of what many consider to be the ultimate solid body guitar. The original Les Paul Standard was the brainchild of famed '50’s guitar innovator and Vice President of Gibson and Epiphone, Ted McCarty. First issued in 1957, the Les Paul Standard was the next step in the ever-evolving design of the original “Les Paul” guitar which McCarty and Les Paul first designed in 1952. The “Les Paul” guitar immediately became a sensation thanks to Les Paul’s tv show and dozens of hit records with wife Mary Ford. Rockers like Carl Perkins and Chuck Berry and electric blues pioneers Muddy Waters and Freddy King reached for “Les Pauls” early in their career. However, McCarty and Paul knew that the “Les Paul” design, as great as it was, was only the beginning in their quest to make a guitar that could, in Les Paul’s words, “sustain for days.” Then in 1957, with the help of Seth Lover's humbucker pickup, the Les Paul Standard brought that dream into reality. Not only did humbuckers give the Les Paul Standard incredible sustain (and buck the hum!) but it also gave players unheard tones with complex overdrive sounds. The Les Paul Standard quickly became a favorite of blues, rock, and country players and would eventually become the standard must-have guitar for everyone from Jeff Beck to Jimmy Page to Zakk Wylde. 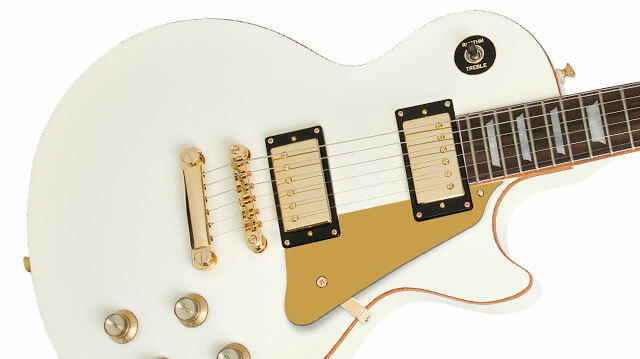 And now Epiphone’s Les Paul Standard Royale makes this must-have guitar affordable with all the original trademarks plus a must-see Pearl White finish with gold sparkle binding. The Les Paul Standard Royale is protected by the famous Epiphone Lifetime Limited Warranty featuring Gibson 24/7/365 Customer Service and guarantees the instrument against defects in materials or workmanship. Experience a Les Paul Standard Royale today at your favorite Authorized Epiphone Dealer. The Les Paul Standard Royale features a solid mahogany body with a carved maple top to deliver classic “Les Paul” tone along with an eye catching Royale gold pickguard and gold strap button. The hand-set mahogany neck features the classic 24.75” scale with medium jumbo frets. The rosewood fingerboard has a Trapezoid pearloid inlay and the 14 degree headstock gives you more pressure at the nut for better sustain without the tuning hang-ups you get from string-tree gadgets. The headstock also features Les Paul’s iconic signature with a classic Epiphone logo. Underneath the hood are Gold Alnico Classic Humbuckers which give this 'king of the solid body guitars' a rich warm tone. Epiphone uses a double vacuum waxing process to ensure quite operation free from microphonic hum which – after 60 years — is a problem for many vintage Les Paul Standards. The Royale’s Alnico Classic Humbuckers are first put in a specialized wax vacuuming system before the cover is placed on the unit to ensure that the wax fully penetrates to the very center of the pickup and solidifies all parts. After the cover is placed on, it is again given a second vacuum wax bath until the unit is completely saturated with wax. Epiphone uses only the highest quality parts for its pickups including ABS plastic bobbins, 1010 Cold Rolled Steel pole shoes and pole screws, Alnico magnets and the finest magnet wire available. 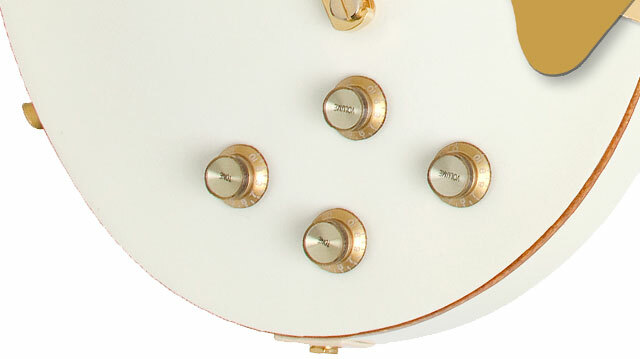 The Les Paul Standard Royale includes 1" diameter potentiometers for better "throw", longer life and reliable service, an all metal toggle switch with rugged spring-steel contacts, and a heavy duty output jack. 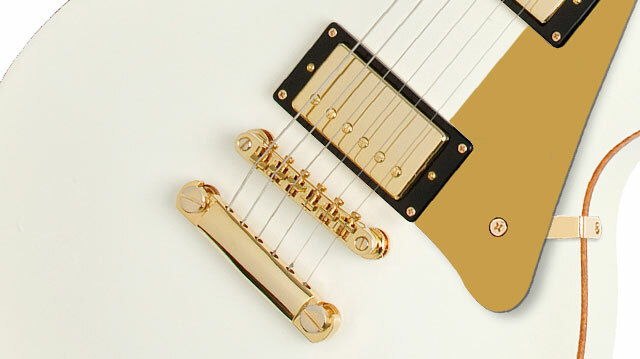 The Les Paul Standard Royale employs Gold Grover® Machine heads for a long life of tuning stability. Also included as standard equipment on the Epiphone Les Paul Standard Royale is Epiphone’s exclusive gold LockTone™ locking Tune-o-matic bridge and Stopbar™ tailpiece which yields even more sustain.